A history of Japan, from its centralization in 1603 to the recent past. The culmination of McClain’s (History/Brown Univ.) work is the Meiji Restoration, where a group of young officials “enlightened” the island country in the mid-19th century, bringing it into the Western-dominated system of international relations. The author shows how that revolution introduced industrialization and democratic reforms into Japanese society, changes that greatly benefited women and the peasantry while disenfranchising samurai and other members of the elite. He also shows, however, how cultural themes from the former government of shoguns—xenophobia especially—persisted in the nation well into the 20th century. The Meiji Restoration, as its name implies, was backward-looking. It sought to reconnect the Emperor with the Japanese people so as to create a population that was more patriotic—and therefore more likely to sacrifice itself in terms of hard work and service to a newly formed army of conscripts. Meiji leaders embraced Western-style reforms because they wanted to be independent of the unfair commercial treaties the West had placed upon them. When Japan finally developed the military power to modify the treaties—its victory over Russia in 1905 was the crowning achievement of the Meiji administration—the government proceeded to mimic the policies of the imperial states it once labeled barbarous. Japan’s invasions of Korea, China and, in WWII, much of Asia, were marked by a savagery that reflected its vision of itself as a superior culture. This superiority complex proved the country’s Achilles’ heel, though, as it gambled that the US, lacking a tradition of leadership by the military, would not rise to the challenge of a full-out Pacific war. McClain’s attention to postwar Japan focuses on the country’s relations with the US, its recently booming, and now faltering, economy, and the partisan maneuverings of the Liberal Democratic Party. 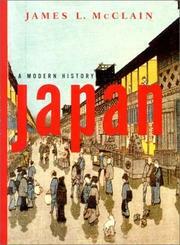 An excellent general history that chronicles the rise and fall of a bygone Japan.